The April 2011 Fukushima earthquake (福島県浜通り地震, Fukushima-ken Hamadōri jishin, lit. "Fukushima Hamadōri earthquake") was a potent magnitude 6.6 Mw intraplate aftershock that occurred at 17:16 JST (08:16 UTC) on 11 April, in the Hamadōri region of Fukushima, Japan. With a shallow focus of 13 km (8.1 mi), the earthquake was centred inland about 36 km (22 mi) west of Iwaki, causing widespread strong to locally severe shaking. It was one of many aftershocks to follow the 11 March Tōhoku earthquake, and the strongest to have its epicentre located inland. The earthquake occurred as a result of normal faulting to the west of Iwaki, and triggered numerous landslides across adjacent mountainous areas. A few fires broke out, and 220,000 households lost electricity. Officials issued localised tsunami alerts, though no significant waves were generated. The earthquake caused little structural damage, but killed four people and injured ten others. The strong ground movements triggered the reactivation of a nearby geological fault, prompting researchers to conduct extensive surveys in the region. The magnitude 6.6 Mw Fukushima Hamadōri earthquake occurred inland on 11 April 2011 at 08:16 UTC at a focal depth of 13 km (8.1 mi), about 36 km (22 mi) west of Iwaki, Fukushima, or 161 km (100 mi) north-northeast of Tokyo. To the east of the epicentre, the oceanic Pacific Plate is subducted beneath the continental Okhotsk Plate, on which much of Honshu's Tōhoku region is situated. Building stress near the resultant plate boundary has led to the development of shallow inland faults through crustal deformation and folding along the east coast of Tōhoku. This intraplate earthquake occurred in the vicinity of the Idosawa Fault – a shallow crustal fault in the Hamadōri region near Tabito town, Iwaki city, that had previously been inactive. Surveys near the epicentre revealed a surface rupture of about 11 km (6.8 mi) and numerous fault scarps, with general vertical displacements of 0.8 to 1.5 m (2.6 to 4.9 ft); a maximum displacement of 2.3 m (7.5 ft) occurred at the small village of Shionohira. Localised right-lateral slip of 30 cm (12 in) was observed at the subsiding west side of the rupture. The segments of the Idosawa Fault associated with this surface feature were classified as the "Shionohira Fault" in 2011. The proximate Yunodake Fault, a normal dip-slip fault northeast of the Shionohira Fault that had been dormant for 120,000–130,000 years, also ruptured during the quake. These observations indicated that the earthquake occurred as a result of normal dip-slip faulting with some strike-slip component. Although it was centred near a different fault zone, the earthquake was classified as an aftershock of the 11 March Tōhoku earthquake, which occurred offshore about 235 km (146 mi) to its northeast. The magnitude 9.0 Mw earthquake triggered widespread seismic activity, and its aftershock sequence includes well-over 67 earthquakes of magnitude 6.0 Mw or greater. Apart from the Fukushima Hamadōri earthquake, four of the aftershocks measured magnitude 7.0 Mw or higher. The Fukushima Hamadōri earthquake, however, was the strongest of the aftershocks to have its epicentre located inland. Early estimates placed the strength of the earthquake at a magnitude of 7.0–7.1, but the United States Geological Survey (USGS) lowered the magnitude to 6.6. The Japan Meteorological Agency (JMA) assessed a magnitude of 7.0 Mj and a depth of 6.4 km (4.0 mi). The Fukushima Hamadōri earthquake was succeeded by a number of smaller tremors; that same day, at least 11 earthquakes of magnitude 3.5 Mj or higher were recorded near its epicentre. Of the series, the strongest registered at a magnitude of 5.5 Mj and occurred within 3.5 hours after the initial quake. A shallow magnitude 6.0 Mw (6.4 Mj) earthquake and several smaller tremors struck the region on 12 April. The earthquake struck in the late afternoon near a moderately populated region of the Fukushima Prefecture, although most structures around the epicentre were resistant to earthquake shaking. Focussed at an unusually shallow depth, the earthquake generated significant shaking throughout many adjacent prefectures. The strongest ground motion registered at severe (MM VIII) in Ishikawa town on the Mercalli intensity scale. Strong shaking (MM VI) spread through Iwaki, Sukawaga, Kuroiso, Ōtawara and Kitaibaraki, with light tremors (MM IV) felt in areas up to several hundred kilometres from the epicentre, including Tokyo and Yokohama. The earthquake cut electricity to about 220,000 households, with most of the cuts reported in Iwaki city. Workers at the Fukushima Daiichi power plant – distanced 70 km (43 mi) from the epicentre – evacuated to safety, and external power to the plant was cut. The outage briefly disrupted cooling water injections into three of the reactors, but services to the plant were restored by 18:05 JST. Authorities at Tokyo International Airport closed all runways momentarily, while NTT DoCoMo restricted voice calls in 14 prefectures following the quake. East Japan Railway Company temporarily suspended its services to restart four of five bullet-train lines; other Shinkansen bullet trains in the region were also halted. The earthquake sparked several fires in Iwaki, with one fire breaking out in Asakawa town. Fire engines extinguished a blaze in a liquefied natural gas tank at Daiichi Sankyo's Onahama Plant. Most of the structural damage was due to scattered rock- and landslides along hillsides in the vicinity of Iwaki. A landslide crushed two vehicles and buried three homes in the city, trapping a number of the inhabitants. The incident resulted in two immediate deaths. Four people were critically injured and taken to hospital; one of them was later pronounced dead. The Iwaki Ibaraki Route 14 interchange of the Jōban Expressway, which runs from Misato, Saitama, to Tomiya, Miyagi, was cut off to traffic by a large landslide of 120 m × 100 m (390 ft × 330 ft). In Tabito town, very close to the epicentre, a 170 m × 50 m (560 ft × 160 ft) landslide resulted in the formation of a quake lake – a natural damming of a river by mass wasting – with a water level of 15 m (49 ft) and a storage volume of 1,000–2,500 m3 (35,000–90,000 cu ft). Significant land deformation with traces of uplift was observed in and around town, affecting local roads but largely sparing its structures. A total of seven people from other regions near the epicentre, including southern Ibaraki, Tochigi and Kanagawa prefectures, suffered minor injuries. Another person was injured during the magnitude 6.0 (Mw) aftershock of 12 April. In a report from July 2011, the Fire and Disaster Management Agency confirmed a death toll of four from the earthquake. The Earthquake Early Warning system was activated upon the detection of primary waves – seismic waves that forego an earthquake's perceivable ground motions – giving residents 6.8 seconds to seek cover before the main shock. At the risk of a tsunami – which reach their destructive wave heights near shallow coastal waters – local fishing boats along coastlines were shown heading out to sea on national news broadcasts. A warning for a localised tsunami of up to 2.0 m (6.6 ft) was issued by the Japan Meteorological Agency; however, no significant waves were recorded, and the warning was cancelled soon thereafter. In response to the earthquake, the fire department dispatched search and rescue teams and emergency crews for relief efforts and damage assessments throughout the affected area. Six medical crews in pairs of two were also sent to Kanagawa, Chiba and Gunma prefectures. Former Prime Minister Naoto Kan postponed a press conference scheduled for 17:50 JST marking the one-month anniversary of the catastrophic Tōhoku earthquake and tsunami. The Fukushima Hamadōri earthquake occurred in a region with historically low levels of seismicity; studies showed that the recent activity near the fault zone had been triggered by the Tōhoku earthquake. Ever since the earthquake triggered their reactivation, the Shionohira and Yunodake faults have provided essential data for local geological surveys on regional land deformation, sedimentary rock distribution and landslide vulnerability. In the earthquake's aftermath, Professor Yagi Hiroshi from the Faculty of Education, Art and Science noted that "a possibility exists for widespread aftershocks of the same size to occur in the near future." ^ a b c d "M6.6 - eastern Honshu, Japan (BETA) 2011-04-11 08:16:12 UTC". earthquake.usgs.gov. USGS. 11 April 2011. Retrieved 2014-06-07. ^ a b 2011年4月11日の福島県浜通りの地震に伴う地表地震断層について. outreach.eri.u-tokyo.ac.jp (in Japanese). Outreach and Public Relations Office. 13 April 2011. Archived from the original on 28 April 2011. Retrieved 2011-04-23. ^ "M-9 Tohoku quake cycle may be 260 years". Yomiuri Shimbun. 8 September 2011. Retrieved 4 February 2012. ^ 先日のＭ７余震、予想外の井戸沢断層が原因. Yomiuri Shimbun (in Japanese). 16 April 2011. Retrieved 4 February 2012. ^ a b いわき市の地表に７キロの断層　４月１１日の余震でずれ. asahi.com (in Japanese). Asahi Shimbun Company. 13 April 2011. Retrieved 2011-04-23. ^ a b c Ishiyama, Tatsuya; Sugito, Nobuhiko; Echigo, Tomoo; Sato, Hiroshi (2011). 第3報（9月7日掲載）: 2011年4月11日の福島県浜通りの地震に伴う地表地震断層のトレンチ掘削調査（速報） (Report). 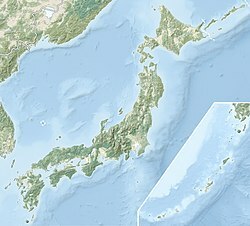 2011年4月11日の福島県浜通りの地震に伴う地表地震断層について. Outreach and Public Relations Office. Archived from the original on 19 February 2012. Retrieved 31 January 2012. ^ a b c Kelson, Keith I.; Harder, Jr., Leslie F.; Kishida, Tadahiro; Ryder, Isabelle (5 June 2011). Preliminary Observations of Surface Fault Rupture from the April 11, 2011 Mw6.6 Hamadoori Earthquake, Japan (an aftershock of the March 11, 2011 Tohoku Offshore Earthquake, Japan) (PDF) (Report). Geotechnical Extreme Events Reconnaissance. pp. 1&nbsp, 6. GEER-025d. Archived from the original (PDF) on 16 May 2013. Retrieved 31 January 2012. ^ a b Status of investigation on Yunotake Fault (quick report) (PDF) (Pamphlet). Press Conference Handouts Archive: November 2011. Tokyo Electric Power Company. 21 November 2011. ^ "Magnitude 9.0 - near the East Coast of Honshu, Japan". earthquake.usgs.gov. USGS. 11 March 2011. Archived from the original on 28 April 2011. Retrieved 2011-04-28. ^ Choi, Charles Q (19 April 2011). "Japan earthquake triggered smaller quakes around the world". msnbc.com. MSNBC. Retrieved 2011-04-23. ^ Magnitude 7.0 – off the East Coast of Honshu, Japan (Report). USGS. 10 July 2011. Earthquake Summary. Archived from the original on 15 October 2011. Retrieved 31 January 2012. ^ "Magnitude 7.1 – near the East Coast of Honshu, Japan". earthquake.usgs.gov. USGS. 11 April 2011. Archived from the original on 24 April 2011. Retrieved 2011-04-23. ^ a b "2011 Significant Earthquake and News Headlines Archive". earthquake.usgs.gov. USGS. 2011. Archived from the original on 26 April 2011. Retrieved 27 April 2011. ^ AFP (11 April 2011). "Japan rattled by 6.6 aftershock". theage.com.au. The Age. Retrieved 2011-04-23. ^ a b c d e f g h i Biggs, Stuart (23 April 2011). "Magnitude-6.6 quake hits Japan near stricken nuclear power plant". Bloomberg Businessweek. Archived from the original on 17 April 2011. Retrieved 2011-03-23. ^ 福島県浜通りの地震について (PDF). jma-net.go.jp (in Japanese). Sendai District Meteorological Observatory. 11 April 2011. Archived (PDF) from the original on 23 May 2011. Retrieved 2011-05-02. ^ "Earthquake Information 2011/04 (UT)". fnet.bosai.go.jp. National Research Institute for Earth Science and Disaster Resilience. April 2011. Retrieved 2011-04-23. ^ "Event – 36.9N 140.6E, 8km Mw5.5". fnet.bosai.go.jp. National Research Institute for Earth Science and Disaster Resilience. 11 April 2011. Retrieved 2011-04-23. ^ Earthquake in Hamadori, Fukushima Prefecture on April 11, 2011 (Report). Headquarters for Earthquake Research Promotion. 12 April 2011. Retrieved 31 January 2012. ^ a b c "（３）平成23 年４月11 日の福島県浜通りの地震・平成23 年４月12 日の福島県中通りの地震" (PDF). 平成23年４月　地震・火山月報（防災編）. Japan Meteorological Agency. 2011. ^ a b "Pager - M 6.6 – Eastern Honshu, Japan". earthquake.usgs.gov. USGS. 11 April 2011. Retrieved 2011-04-22. ^ "Pager Version 4 - M 6.6, Eastern Honshu, Japan" (PDF). earthquake.usgs.gov. USGS. 11 April 2011. Retrieved 2011-04-22. ^ "Fukushima Daiichi Nuclear Power Plant - 1–4 unites - Japan". tageo.com. Tageo.com. Retrieved 2011-04-28. ^ a b Boyd, John (11 April 2011). "Quake and tsunami warning halt work at Fukushima Plant". spectrum.ieee.org. IEEE Spectrum. Retrieved 2011-04-27. ^ Associated Press (11 April 2011). "7.1 magnitude earthquake shakes northeast Japan". abcactionnews.com. ABC Action News. Retrieved 2011-04-26. ^ CNN Wire Staff (11 April 2011). "At least 6 killed in new Japan earthquake". articles.cnn.com. CNN World News. Archived from the original on 2 June 2011. Retrieved 2011-04-23. ^ "Japan earthquake: three killed in powerful aftershock". telegraph.co.uk. The Telegraph. 12 April 2011. Archived from the original on 26 April 2011. Retrieved 2011-05-15. ^ a b c 福島県浜通りを震源とする地震（第１１報） (PDF) (in Japanese). Fire and Disaster Management Agency. 13 April 2011. Retrieved 2011-05-16. ^ a b Sediment‐related disasters and sabo‐related facilities (PDF) (Report). Reconnaissance Survey on Damage to Infrastructures. Public Works Research Institute. 2011. pp. 10–13. Archived from the original (PDF) on 16 May 2013. Retrieved 31 January 2012. ^ Seismic Activities from Hamadori, Fukushima Prefecture to Northern Ibaraki Prefecture (Report). Japan Meteorological Agency. 20 September 2011. Retrieved 31 January 2012. ^ "Life of a Tsunami". Western Coastal & Marine Geology. USGS. 22 October 2008. Retrieved 2011-04-27. ^ Staff Writer (11 April 2011). "Japan hit by 6.6 magnitude earthquake". rte.ie. RTÉ News. Retrieved 2011-03-23. ^ Tetik, Cigdem (11 September 2011). "Implication of recent case histories of earthquake-inflicted mass movement; a case studies at Ojiya City aftermaths the 2004 Mid Niigata Prefecture Earthquake and at Iwaki City aftermaths the 2011 Fukushima Prefecture Hamadori earthquake". International Institute of Seismology and Earthquake Engineering.